The thing about skiing Lake Tahoe is you can be very lucky or very much not lucky. For several recent winters, Tahoe had been an unlucky destination, with drought conditions and virtually no natural snow. Sometimes it can be hit by the Pineapple Express – a stream of warm, moist weather off the Pacific Ocean, which brings hellishly heavy wet snow or even rain. Other times, cold air comes down from the northwest, laden with enough potency to drop several of feet of snow every day for a week. That last alternative is what happened in January 2017, when Tahoe received an amazing 245 inches of snow: more than 20 feet, including up to 13 feet at some upper elevations in one four-day period. It was actually too much of a good thing. There was so much snow that resorts had to close to dig out their chairlifts and bases, not to mention dealing with avalanche threats, and roads were closed for days. It was this snow-pocalypse that prompted my friend Mike and I to spend a long weekend in February visiting the resorts of North Lake Tahoe. For the uninitiated, Tahoe is not a specific resort but a region – a beautiful alpine lake in the Sierra Nevada, about three hours west of San Francisco and 45 minutes east of Reno. The lake and surrounding mountains are ringed by more than a dozen ski resorts. 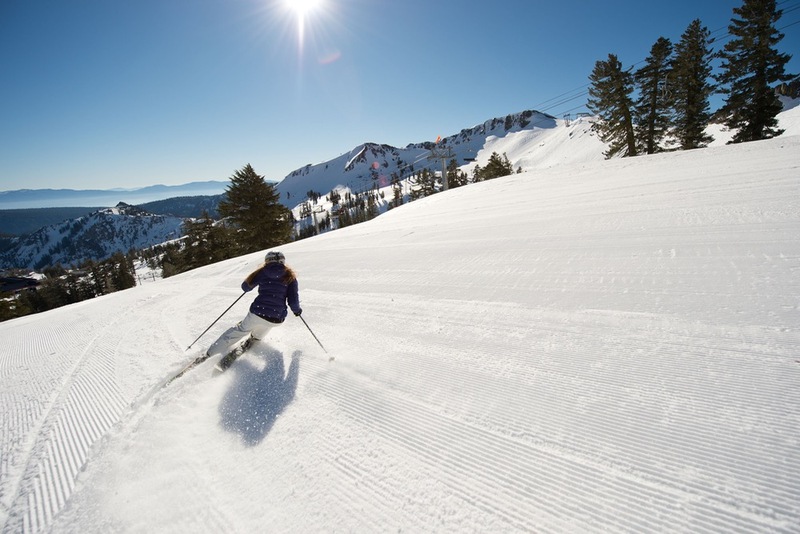 To the south there’s glitzy Heavenly, rugged Kirkwood, and small-and-woodsy Sierra-at-Tahoe. 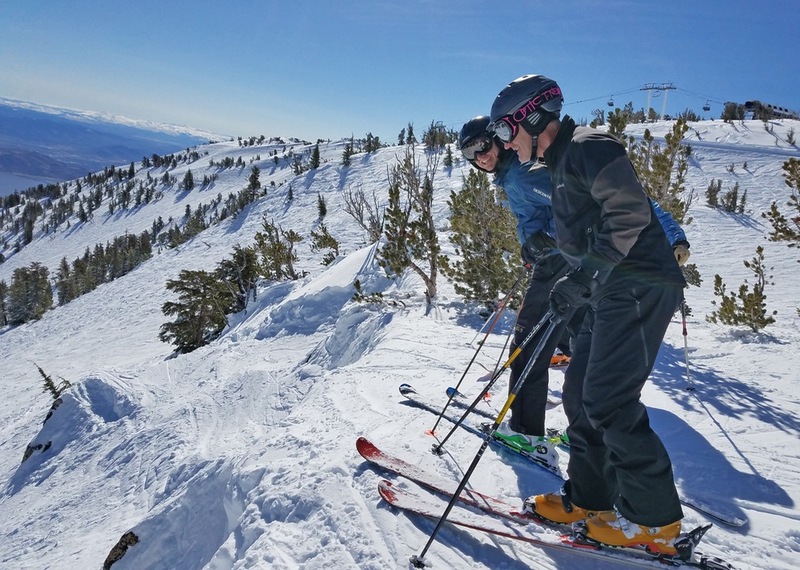 At the north end there’s massive Squaw (if you’ve ever seen the 80s ski romp “Hot Dog: The Movie,” that’s where it was filmed), its rugged neighbor Alpine Meadows, the family-oriented and high-end Northstar, local favorite Mt. Rose, and often-overlooked but delightful Sugar Bowl. For our short trip, we made a plan to focus on the north, flying into and out of Reno and spending a day each at five ski areas. Of course, nature had its own plans. Tahoe is a fickle ski mistress, not unlike the east in terms of weather – at times, about as much of a gamble as the games of chance in nearby Reno. Snowstorms here are described by what elevation the rain/snow line is. The lower the line, of course, the better the snow up high. We flew in on a Wednesday, which turned out to be day three of a four-day torrential downpour in the mountains. You rarely want to see the term “soaking rain” to describe the expected weather for your ski trip, but that was what we had in store, at least at first. It was so warm that even the summits were getting wet. Locals told us they’d never seen weather like this. Roads were flooded; mudslides were closing major highways; and don’t even mention the wind. Summits were being hit with 100+ mph blasts. It was into this maelstrom that Mike and I arrived. Actually, down in Reno, it was still sunny and calm. We’d planned to ski Northwood the next day, thinking its sheltered terrain would keep it safe from the high winds, but unfortunately it too was closed. Northstar is certainly the poshest resort in the region, offering champagne breaks during the day and s’mores for sale next to roaring gas fires at the base area. That said; the resort still has plenty of expert runs, including a variety of glades, that I was interested in exploring. Next time. Instead of skiing, we spent our first day in Reno, where – aside from a massive rainbow that spanned the valley – there was no indication of the rough weather assaulting the mountains only a half-hour to the west. 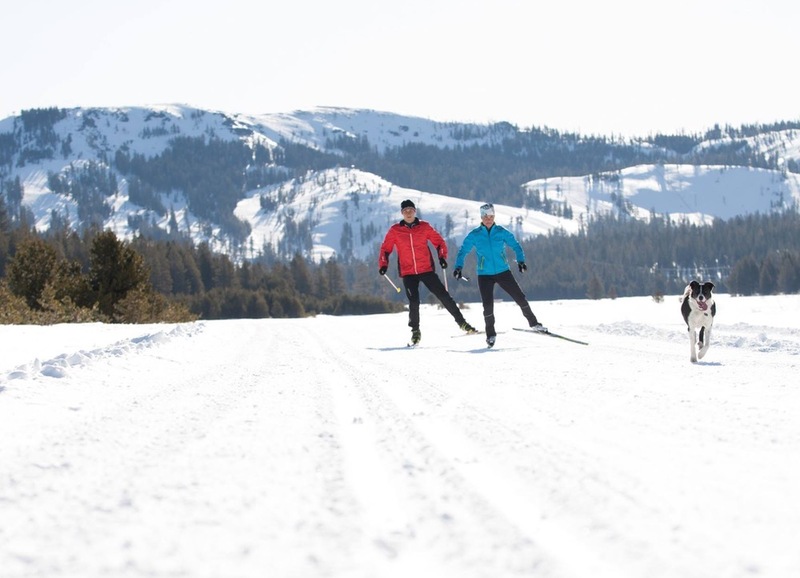 For the cheapskate skier, Reno offers inexpensive lodging only a short drive from resorts (weekend traffic or mudslide closures aside, of course). We stayed in The Sands resort the first night, where we got a room for only $45. The room was great; what was less appealing was the casino downstairs that reeked of cigarette smoke, or the drunk, tattoo-covered young lady attracting the interest of security. It seemed half the gamblers there were using walkers, wheelchairs, or oxygen: clearly not an outdoorsy crowd. Reno is actually an up-and-coming city with a burgeoning arts scene, thanks mainly to the proximity of Burning Man and a growing hipster crowd. By the time we woke up the next day, the precipitation had turned to snow and Squaw Valley, our first destination, was reporting 32 inches of fresh. Of course, this was California snow, which comes with its own issues. When we arrived, only a few lifts were operating. This was my second time there, and they had the same problem last time. Even the famed KT-22 lift was closed and the line on the nearby lift, Red Dog, stretched down to the parking lot. We overheard a local suggest walk ten minutes to the Far East Express, which was virtually empty. This turned out to be an excellent idea except that the parking lot was so deep in water and slush it threatened to overflow our ski boots. “Welcome to Lake Squaw,” one skier muttered as I churned my way through. The nice thing about Squaw is that, even with only a few lifts running, there’s plenty of accessible terrain, especially during the week. On weekends, watch out – a recently-circulated photo of KT-22 showed a line so long it defied description (at the time, most of the mountain was closed due to winds). One local told me the line for that famous lift, which accesses 1,800 vertical feet of expert terrain, routinely exceeds a half-hour even on calm days. The skiing was, to be sure, challenging: the epitome of Sierra Cement. It was fun enough to ski untracked, although you couldn’t turn very quickly. Once chopped up, however, the resulting mess was a trip through death cookie hell. I made a mental note to find some wider, heavier skis to demo for our second day. I’m still hoping to get to Squaw when the entire mountain is open, so I can explore its vast terrain. Squaw, home of the 1960 Olympics, had until recently seen better days. Locals still complain that the mountain is understaffed, leaving some lifts closed at times when crowds demand full capacity. Actually, Squaw says the mountain now has the largest staff it’s ever had — 2,600 people — and brings in enough operators to run most lifts even on bad weather days. Either way, the mountain is poised for a resurgence. 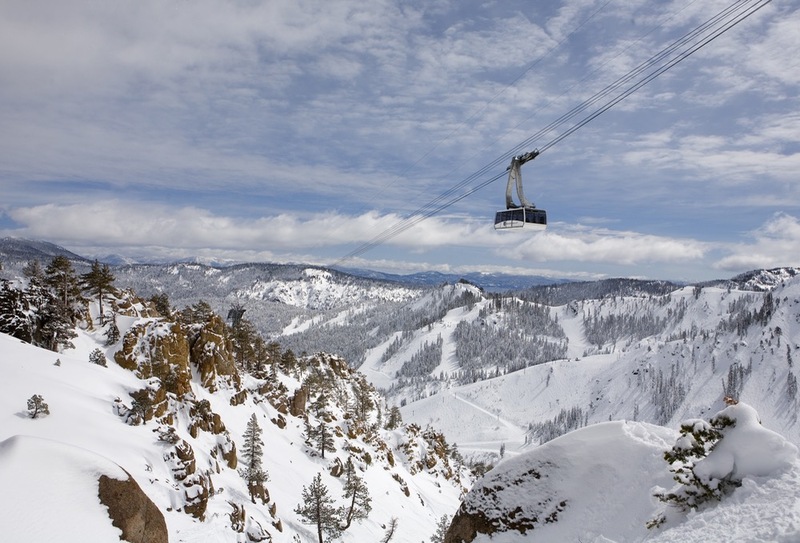 The owners recently purchased neighbor Alpine Meadows and there are plans in the works to connect the two with a gondola. The result will make one of the largest resorts in the country. This, along with planned investments in infrastructure and the base area, may help give Squaw the national prominence it deserves. At the end of the day, we returned to Truckee, a delightful mountain town first settled during the construction of the Transcontinental Railroad. Today, trains still define the town. Its historic main streets offer high-end tourist goodies and delicious eats, while locals complain about rising property costs and weekend crowds. Speaking of food, there’s lots of reasonable fare in town. One night, I had a respectable calamari and basil dish for $15 at the local Thai restaurant, Siam Cuisine, and for self-caterers, there’s a Safeway. Be sure to check out Jax at the Tracks for a diner that looks like it came out of the 1950s. It’s also possible to splurge on some serious gourmet dining if you wish, which is what brought us to the Truckee Tavern. This relatively new restaurant offers delicious entrees and some very creative cocktails as well. Co-owner Chris St. Martin, an East-Coast native who worked at restaurants in Truckee for more than a decade, partnered with Ryan Dierks, a bartender and talented mixologist, to create this upscale gem in 2014. The restaurant keeps its food sources as local as possible, acknowledging the growing popularity of the farm-to- market movement. Mike and I shared a large ribeye, which was very tasty. But what we couldn’t stop raving about were the side dishes and appetizers, including ricotta ravioli with mushrooms, roasted Brussel sprouts with chèvre, and the mac and cheese made with bleu cheese. We didn’t think we’d have room for dessert, but the decadent chocolate mousse cake proved otherwise. It’s amazing how Tahoe snow can change so quickly. What was mashed potato glop a day earlier had somehow transformed into delicious dry powder. Unfortunately, the snow was no secret and it seemed all of California was now standing in front of us at the chairlift. We made the best of it, seeking out amazing lines of two-foot fresh while it lasted and jumping on upper-mountain lifts when they opened in the afternoon. 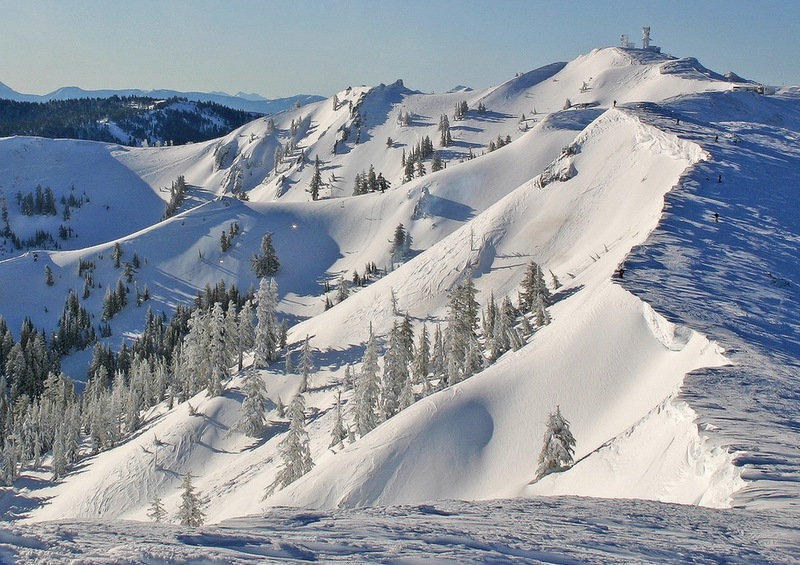 Alpine Meadows’s serene terrain makes a fine counterpoint to Squaw’s often in-your-face gnar. At one point, we rode the Kangaroo Chair and then followed a long track that headed skiers’ right above pristine powder. You could duck in anytime for perfect turns, although the further you headed in, the more fresh you got. Eventually, as the upper lifts opened and the crowd thinned out, we made our way to Lakeview, which offers a stellar view of Lake Tahoe to the east. We eventually took the Alpine Bowl Chair to the resort’s highest point, 8,637-foot Ward Peak. From there, we did laps and searched for remaining powder lines on the resort’s upper slopes. Be warned: Alpine and Squaw don’t use double black diamonds on their trails, so unless you’re a true expert skier, make sure you don’t wind up a trail beyond your comfort level. Mt. Rose is very much a local’s mountain, but it’s challenging enough to attract out-of-town skiers as well. 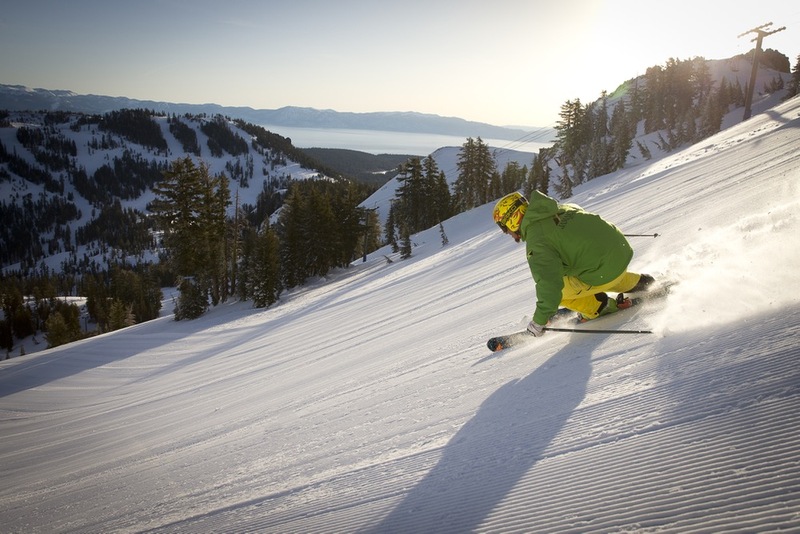 The resort is the highest in Tahoe – the base begins where most mountains top out – ensuring the best snow around. Considering the traffic I hit climbing up the winding road from Tahoe, I thought it’d be crowded on a sunny Sunday; however, the resort’s two six-pack chairs kept traffic flowing briskly throughout the day from the two bases. We skied together for an hour, until “beer-thirty” called to them and I moved on to the mountain’s front side. From the summit, you can traverse around on skier’s left to Powder Ridge, which offers a huge amount of ungroomed intermediate terrain. You can hike up and over the summit, following the Wild Card trail, for even more vertical. During my lunch break, I happened to look up at the mountain and saw new tracks in the Chutes. They were open! I grabbed my gear and headed out. The Chutes have only been legal to ski since the mid-00s, although plenty of skiers had poached them previously. About 15 different routes offer steeps ranging from 40 to 55 degrees up to a thousand feet high. They’re not to be taken lightly. A local skier, a doctor, who hiked into the chutes in the early season when the sector was closed, perished in an avalanche. I made my first run on Jackpot, which lived up to its name. As I contemplated the first drop, a skier howling with delight careened like a pinball off cornice walls and into the deep powder. Wishing I could ski like that, I made my way more carefully down the slope, into the maw of the chute. Rock walls rose on both sides, but the powder was so deep there was no danger of slipping. At one point, I stopped to survey the steeping terrain below. To my right, the same skier who’d passed me earlier stood perched on a rocky outcrop, surveying the terrain like an eagle searching for prey. He sensed my hesitancy and said, “Take your time. Get your mind right. If you go into terrain you’re not comfortable in, just turn around.” I nodded and continued my descent through silky powder. I spent the rest of the day in the chutes until it closed for the day. Sugar Bowl is the first ski mountain you hit when coming up from the California side. It’s a historic place, more than 75 years old and located not far from where the Donner Party famously resorted to cannibalism during the winter of 1846-47. If the weather on your ski trip turns lousy, just remember that things can get a lot worse. It opened in 1939 and soon began to attract celebrities like Errol Flynn. Walt Disney was an early investor and a peak here is named for him. It’s the only resort in America where you can’t drive to its “snowbound” Village, one of the resort’s two bases. You arrive via a rickety gondola – the kind where the operators lock you in with a key. Overnight guests can stay at a hotel in the resort’s base lodge, a wooden building filled with historic photos. The base is also connected to Royal Gorge, one of the nation’s largest cross-country-ski resorts, which Sugar Bowl acquired a few years ago. Though the name may sound quaint, Sugar Bowl contains some seriously steep terrain off both of its summits. Even two days after a storm, conditions were delightfully soft and powdery. My favorite shots were the Sisters Chutes, a series of 45-degree slopes that squeeze between rock walls. One run descends past a cave, and was visible from the chairlift. After eyeing it all day, I finally decided to head down and take a look and enjoyed the unique visual of watching skiers schuss pass by the cave’s open maw. California often requires chains on snow days and it shows on the roads – even the interstate was riddled with gouges. We bought a set from Wal-Mart, even though the rental company advised us against using them due to possible damage to the car, so make sure that they’re put on properly! I’d already returned the unused chains to Wal-Mart (don’t try this if you’ve installed them; they check) before driving to Mt. Rose thinking I wouldn’t need them anymore. Thus, I was amazed to see a “chains required” sign flashing on the way up. There was snow on the road, but nothing a normal car couldn’t make it through. However, when I tried to drive over into California, a trooper was checking to make sure everyone had chains. This meant that we had to drive back through Reno to get back to Truckee, which would have been fine, except a mudslide had closed I-80. With the detour, the trip from Reno took two hours, more than double the normal time.